If you go to NBA.com or any official NBA team website, you won't see any pictures of current basketball players, no Kobe, Lebron, Durant, nobody. Why? It's because the NBA isn't allowed to post pictures of any of their players. 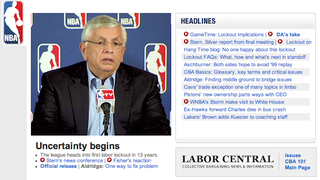 The NBA just kickstarted their lockout at 12:01AM today and players and owners are no longer friends. The owners and players union couldn't come up with a deal that'll fairly split millions and millions of dollars to millionaires and billionaires so they decided to lockout and cease relationships with one another (at least until a fair deal is made). That means the NBA can't profit off their players by posting pictures of their star players online. It's just coaches, assistant coaches, mascots, etc. (They can't even contact players without suffering a $1 million fine). So no Dirk in championship glory for the Mavs, no pictures of the hope of Stat and Melo for the Knicks and no championship-party-before-you-won-the-championship party for the Heat. It's funny because the lockout transforms the NBA's websites—previously packed with game photos, awesome highlight clips and player features—into something that looks like it's from 1998 (the NBA can post pictures of retired players, which only doubles the vintage effect). It's miserable. Where's my dunks? It's no fun. Where's my buzzer beaters? The website is like going back to law school with all these links about CBA's and legal info. Just give me Blake Griffin. Who's Kobe? If I'm a Laker fan I'm SO STOKED about John Kuester that I want him to be front page news!! The new Big Three: A Pool donut, a Pool hoop set and a Pool mattress (not pictured). I wonder if there's metaphors here. Maybe the only site that makes sense, since if your team won the championship, you want as much gear as you can get your hands on. Some teams have just resorted to showing pictures of their cheerleaders. Which is a very a good idea.